On the 23rd (Tue), get a new perspective on things with Boat Tours & Water Sports, then get outside with Lac de Serre-Poncon, then contemplate the long history of Abbaye de Boscodon, and finally contemplate in the serene atmosphere at Notre-Dame-du-Real. For other places to visit, maps, reviews, and tourist information, read Savines-le-Lac trip planning tool . Innsbruck, Austria to Savines-le-Lac is an approximately 8-hour car ride. You can also fly. In July, daytime highs in Savines-le-Lac are 32°C, while nighttime lows are 19°C. Cap off your sightseeing on the 23rd (Tue) early enough to travel to La Salle les Alpes. On the 24th (Wed), fly down the slopes at Deval'Bob, let the river carry you with a rafting and tubing tour, and then take your sightseeing to a higher altitude at Col d'Izoard. On your second day here, have fun at Briancon and then hit the slopes at Luge Monty Express. To find reviews, more things to do, and more tourist information, read our La Salle les Alpes trip maker site . Traveling by car from Savines-le-Lac to La Salle les Alpes takes 1.5 hours. Finish up your sightseeing early on the 25th (Thu) so you can travel to Castellane. Castellane is a commune in the Alpes-de-Haute-Provence department in southeastern France. 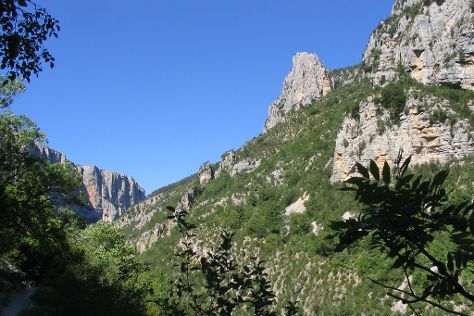 Start off your visit on the 26th (Fri): don't miss a visit to Chapelle Notre Dame du Roc, cruise along Route des Cretes La Palud, and then explore the striking landscape at Les Gorges du Verdon. On your second day here, take a memorable tour with Tours, see the sights as you ascend with a climbing tour, and then snap pictures at Pont du Roc. For photos, maps, and more tourist information, go to the Castellane trip itinerary builder website . You can drive from La Salle les Alpes to Castellane in 3.5 hours. In July in Castellane, expect temperatures between 37°C during the day and 20°C at night. Finish up your sightseeing early on the 27th (Sat) so you can travel back home.